Many of us have unflattering photographs that we would rather forget but most exist in family archives that are easily hidden away. However, if you're a multi-millionaire rock star potentially trying to erase an unfortunate moment, there are always DMCA takedown notices to fall back upon. As regularly documented in these pages, copyright holders expend a lot of energy trying to protect their work from Internet piracy. The tried and tested method is to issue a DMCA takedown notice to webhosts and platforms such as Google, Facebook and YouTube. Millions of these requests are sent and processed every week. However, while copyright holders are fully entitled to protect their work, there are many instances that cause controversy. These cases often amount to ham-handed efforts at taking down infringing content but others arouse suspicions that censorship is the likely goal. Details of several such cases appeared in the Lumen Database’s DMCA archive this week, having been filed there by Google. 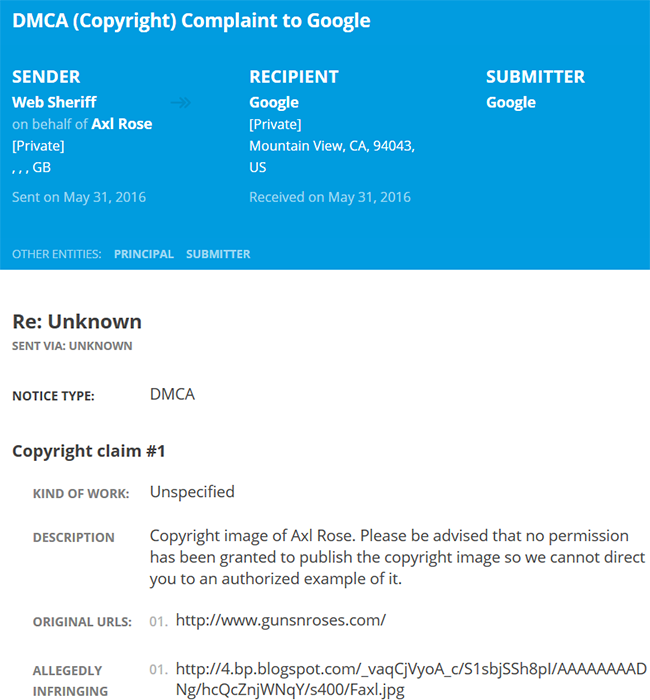 They all relate to a wave of copyright claims sent to Blogspot and GoogleUserContent on May 31, 2016 demanding the removal of pictures depicting Guns N’ Roses singer Axl Rose. 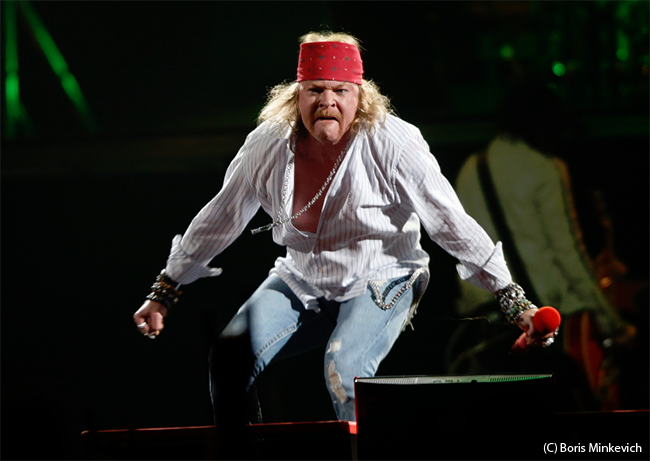 “Copyright image of Axl Rose. Please be advised that no permission has been granted to publish the copyright image so we cannot direct you to an authorized example of it,” the notices sent by Web Sheriff on behalf of the singer read. Each notice (1,2,3,4,5,6) relates to the same image, an excellently framed but rather unflattering picture of Axl Rose taken at the MTS Centre, Winnipeg, Canada, back in 2010. Intrigued, TorrentFreak tracked down the photographer who captured this moment to see if he was aware of these takedown efforts. We eventually found Boris Minkevich at the Winnipeg Free Press where his fine work is published in all its glory. During our initial discussions a few things became clear. Firstly, Minkevich definitely took the photo. Second, Minkevich had no idea that Rose was trying to “cleanse the web” of his photo. Perhaps the first reaction here is that Rose has no right to take down Minkevich’s photo. Since Minkevich was the one who took it, he must own the copyright, right? Web Sheriff doesn’t seem to think so. “We can gladly confirm that all official / accredited photographers at [Axl Rose] shows sign-off on ‘Photography Permission’ contracts / ‘Photographic Release’ agreements which A. specify and limit the manner in which the photos can be exploited and B. transfer copyright ownership in such photos to AR’s relevant service company,” the company told TF in a statement. We contacted Minkevich again and asked whether he’d signed any contracts as suggested by Web Sheriff or had any clear idea of who owns the copyrights. He confirmed that some shows make photographers sign an agreement and some don’t. This event was in 2010, a long time to remember back. However, even if Minkevich took this photograph in an unofficial and/or unauthorized capacity, Web Sheriff still believes there would be issues surrounding ownership. “[If a photographer] was there and taking shots without permission or authority, then other considerations / factors would come-into-play as to what such individuals can and cannot do in terms of attempting to commercially exploit the resultant images of someone else’s show,” TF was informed. So while the waters about who owns what continue to swirl, the big question remains – why target the picture at all? Understandably, Web Sheriff told us that client work is confidential but it’s certainly possible that part of the puzzle lies a quick Google search away. 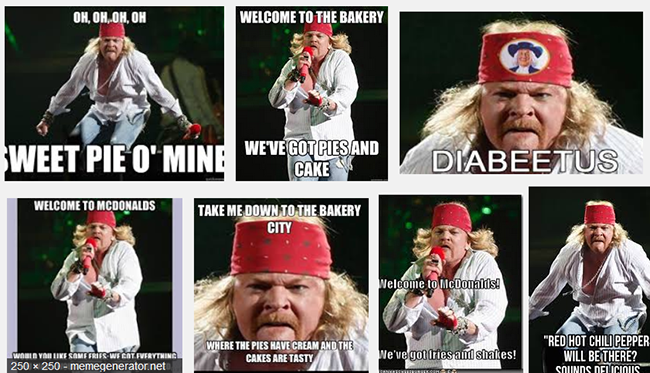 As can been seen below, the photographs taken by Mr Minkevich all those years ago also triggered a viral Axl Rose ‘fat’ meme – hardly the kind of image someone like Axle Rose would like to preserve. While poking fun at someone’s appearance is sadly par for the course on some parts of the Internet, sending DMCA notices is hardly likely to cure the problem, if indeed that’s what the aim of the half-dozen notices was. It’s possible we’ll never find out for sure. Finally, it’s worth pointing out that Google hasn’t complied with the requests to remove the images and all remain up and accessible. That may be because Google believes that Axl Rose doesn’t own the photo and that the copyrights sit with Minkevich and/or the Winnipeg Free Press. Clearly Axl Rose thinks otherwise but as pointed out by Minkevich to TF, the images being targeted on Blogspot are definitely infringing, although perhaps not in the way Axl might’ve hoped. “Either way the photo was stolen off our website with no permission granted by the Winnipeg Free Press,” he concludes.